Alongside the other Big Ten students body presidents, Ohio State University Undergraduate Student Government President Shamina Merchant signed and sent a letter Tuesday to the U.S. House of Representative leaders, urging them not to support the Promoting Real Opportunity, Success, and Prosperity through Education Reform (PROSPER) Act — a bill that would decrease federal student aid awarded. 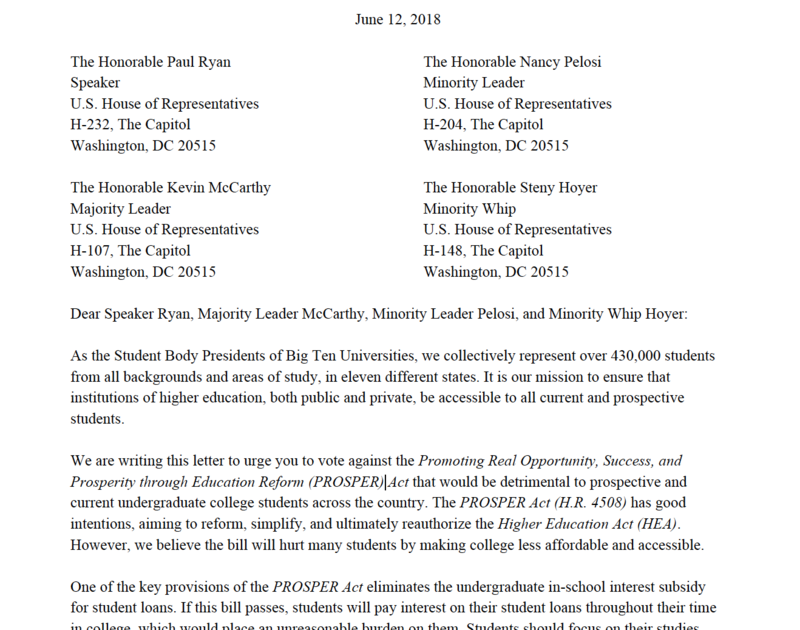 The PROSPER Act plans to reform the current Higher Education Act (HEA), simplifying student aid for higher education and limiting the federal role in the process. The act was introduced in December. According to the letter, the bill would deduct the amount of student aid awarded and could cost students $15 billion collectively over the next ten years. The act plans to eliminate the Federal Subsidized Loan, which covers interests payments on loans while undergraduate students are enrolled. The bill also would eliminate or roll back on other college affordability programs, such as the Federal Supplemental Education Opportunity Grants (FSEOG), federal TRIO programs and the Public Service Loan Forgiveness (PSLF) program. The new education reform act would expand Pell Grants, a federal grant which sees Ohio State pay for the full cost of tuition for its recipients, but the letter claimed this would not make up for the decrease in SEOG. This letter reflects concerns University President Michael Drake has about the PROSPER ACT in its current form, Johnson said. Drake also signed a letter addressed to Representative Joyce Beatty along with the Inter-University Council of Ohio, voicing concerns over the act. 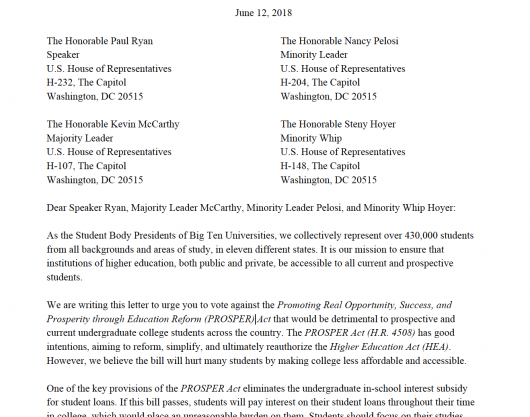 The letter from the Big Ten students and the Inter-University Council also was sent to all Ohio Congressional District members. Merchant said in a statement that she and USG Vice President Shawn Semmler will continue to work with their BIg Ten peers and the country to ensure students’ voices are heard and to increase affordability and accessibility of education. The full letter can be found at https://twitter.com/usgosu/status/1006649928641282049.